One thing I failed to mention in the intro is that my review starts off with a little bit of random chit chat about the brand in question, and also pretty much anything else that happens to be on my mind. And this week the thing on my mind is looming just around the bend. A move. Yes. I am actually thinking of leaving sunny Santa Barbara and heading for the mountainous landscape of Colorado. It’s something I’ve been thinking about for some time, but since my absolute BFF and training partner is now there living in Boulder, it’s on my mind more now than ever before. Don’t get me wrong nobody loves California more than I do. The sunny weather greets you when you wake up every single morning, and puts a smile on your face even when things go wrong. But it’s also insanely expensive place to live, and the tax climate is soo painful. Like. Ugh. I don’t even make THAT much money but I just get fisted pardon the graphic language. So maybe it is time to move on for me. So if you live in the CO area please do shoot me an email because I’m always looking for new swolemates! Ok now let’s chat about Royal Sports Cardio Rush. That’s what we’re here for right? Right. Royal Sport, in case you didn’t know- is an offshoot brand of the mighty Cellucor company- the College Station, TX - based supplement behemoth responsible for the ever-popular C4 pre workout. Other offshoot brands of Cellucor include Neon Sport, and now the Royal Sport. Royal Sport is clearly priced as an even more exclusive, luxury brand beneath the Woodbolt umbrella (Woodbolt International is the name of the parent company of Cellucor). The Royal Sport products are priced well above the standard Cellucor products, which made me pretty excited to try Cardio Rush. The first thing we should cover is probably the flavor. Blue Raspberry: This is the second best flavor of Cardio Rush in my opinion. It tastes exactly like the blue raspberry C4 does, which has never been a favorite of mine. The Cellucor way of doing blue raspberry is to mix an inappropriate amount of blueberry into the mix. With each sip you get intense notes of blueberry, very little raspberry, and a strong amount of sweetness. It is certainly the Cellucor way to add a strong amount of sweetness to the blend, in addition to giving the powder itself a lovely hue. This powder is a beautiful shade of blue, just like C4. I give the blue raspberry flavor an 8/10 just because I’m not a big ‘blue raz’ fan. It’s still pretty tasty though. Fruit Punch: The best flavor of Royal Sport Cardio Rush is fruit punch. I give it a 9.5 out of ten because it is one of the best representations of fruit punch that you will find. It has all the classic tastes of pineapple, cherry, some orange, and like the blue raspberry, a ton of sweet and sour. I think the fruit punch has a little more bitterness which I like. It helps block out some of the stronger-tasting ingredients in the formula. 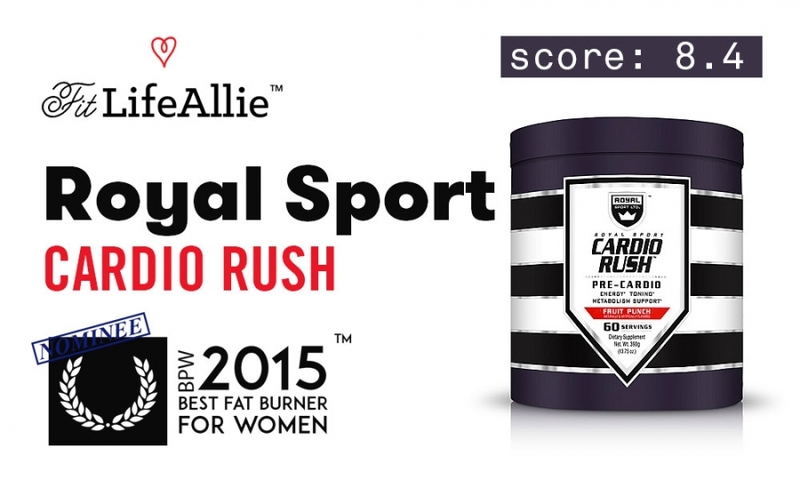 If you are going to grab a tub of Royal Sport Cardio Rush I think you will like this flavor the most. The taste is good. But does Cardio Rush work? So I took Cardio Rush yesterday for a 5000 meter row. I figured this is a cardio formula so I might as well use it for cardio, right? One of the questions that I have coming out of the workout is if this product is better for cardio or if you can use it for weights as well. My gut is that of course you can use it for whatever you want. Heck you can take Cardio Rush and go mow your lawn and clean your room too. But back to the performance. I took a scoop and a half (ok maybe closer to two) scoops about a half hour before I started my rowing workout. I actually had intended to do a bike workout but there are only two bikes in the gym and they are like bolted to the ground about 6 inches away from each other. And I wasn’t trying to bike next to the dude that was on one of the bikes when I got in there. And you wouldn’t have either. Trust me. Lol. Welp, the rowing machine was open. I dread rowing workouts because they are usually very very painful. But that means it’s good for you, right? Sure. I hopped on and started rowing furiously, powered by the Cardio Rush. The feeling you get from Cardio Rush is very very familiar if you are used to taking pre workouts. You can feel the caffeine kick in about 30 minutes after you take it, coupled with the good old beta-alanine tingles. You can also feel some not so familiar effects from this pre workout. What Royal Sport has done with this pre workout is something that Woodbolt also managed to do with the Neon Sport Volt pre workout. They give it dramatic focus and even a sort of ‘euphoria’ that you really don’t find in many pre workouts. Fueled by this focus and energy, I powered through the 25 minute workout with relative ease (for me). I was huffing and puffing I’m sure, but the pre workout seemed to make the time go by faster, and certainly allowed me to push my own limits to a greater degree than usual. The one thing I’m not sure that this pre workout really helped me with was endurance. What are you talking about Allie you just said you powered through the workout easily? Well yes. But that was 25 minutes. I since tried Cardio Sport for an 8 mile jog this morning and found that the product really fizzles out after about 45 minutes. Just something to keep in mind. Let’s look at the supplement facts to breakdown the Cardio Rush ingredients. As you can see, this is actually a really really nicely designed formula. I like every single ingredient in here because each has been proven effective for enhancing athletic performance or ramping up fat loss. From that logic you would think this product should be getting a perfect 10 out of 10 on the formula review grade, right? Wrong. Here’s why. Look at the ‘proprietary blends’ that all these ingredients are contained in. The main ‘Cardio Rush’ blend weighs in at just 1.6 grams, while the toning blend is just about 1 gram. That means of each scoop you are only getting about 2.5 grams of active ingredient! That’s simply unacceptable when you look at how much Royal Sport is charging for this product. Unacceptable and quite frankly a little deceptive in my opinion. Let’s talk packaging to get this sour taste out of my mouth. I’ve gotta give it to the Woodbolt folks I don’t mind the branding of Royal Sport. I always like when brands go a little out of the box to try something different from a branding and packaging standpoint. Royal Sport is a great example of ‘out-of-the-box’. I mean. A medieval-themed supplement brand? Heck yeah. While I love the concept, I think the execution is totally on point. I think they did a nice job finding a balance between making the visual look of the tub reinforce the theme without making it too cheesy and gimmicky. The purple is a brilliant and de-saturated shade that gives a feel of luxury. The striped backdrop is a lovely way to frame the main information panel, that is creatively displayed on a banner shape that looks like it came from Camelot itself! The Royal Sport logo features a crown and is the perfect and iconic emblem to represent the brand. If there’s one thing I’m not overly fond of with this label design it would have to be the font selection. I think they could have found something that is both sporty, and also a little medieval looking. But actually looking a little closer at it, I don’t really mind it. Overall this packaging is splendid. Easily the best part of the product in my opinion. Time to wrap this Cardio Rush review up and get out of here.